With the ever changing times we have today, there’s always something to discover beyond the horizon. We’re never content with what we have, we strive for something new, something better and something that will take us closer to the edge. It doesn’t matter if it’s a minor difference or a major one, it’s still a step towards achieving our goal and even surpassing it. The 2014 Slingshot Turbine 17 meter light wind kite (a free ride light wind kite) has delivered on its promise of more days on water. With 10-12km/h wind, you won’t be standing on the beach anymore, you’d be on your board with your new Slingshot Turbine and it lets you stay on the water even if the wind is picking up. There are a number of improvements on the new design: it now has a direct bridle, mini strut and 5th strut on the wing tip, lighter weight construction. The progressive open delta C design updated with a new bridle 5 point cascading bridle attachment system which gives you a consistent smooth feel and specific control over the power. The new design gives a more powerful grunt without sacrificing riding speed, efficiency or upwind performance. The long lines allows for a long power stroke and you can bet with it’s quality build, it’s gonna last forever -or at least for a very long time. 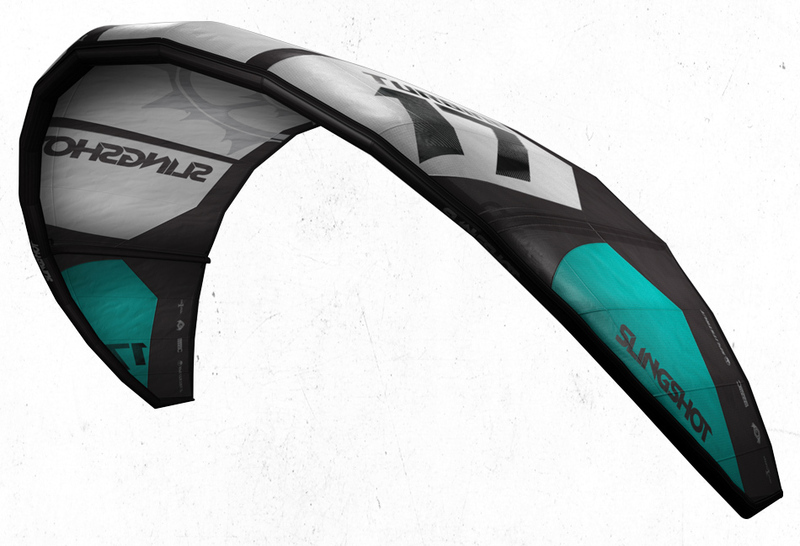 This kite is good for those who are into wakestyle, freestyle, or if you just want to go out there and enjoy the waves. OPEN DELTA C-DESIGN PLATFORM The kite’s a higher aspect ratio in combination with speed improves the lift rather than the angle of attack. The new shape allows the kite to fly forward in the wind window while freeing up the wing tips to prevent the kite from being oversheeted. REFLEX WINGTIP The free pivot wingtips work as natural regulators and open up by the wind to extend the apparent wind range. CONNECT FORWARD ATTACHMENTS The steering lines have a direct connection with the forward “sweet spot” geometry of the kite. Three different settings enables you to fine tune the bar settings for desired bar pressure and turning speed. WINGTIP STRUTS The struts have a conical shape to decrease drag and for a more efficient control. LOWPROFILE WINGTIPS This is a proven design for faster turning speed similiar to the one to Rally. It also reduces drag and hence make the kite even more high performing. ADDITIONAL ATTACHMENT POINT Use the additional attachment points for optimal performance in super-light wind. AUTO-TRIM TRAILING EDGE This design feature automatically reduces the risk for oversheeting and virtually makes it impossible backstall the kite while still allowing the panels to open and flex. CASCADING 5-POINT BRIDLE The bridles are free from pulleys which not only reduce the total weight (only with a few grams, but still every gram counts for light wind kites) but also gives you a more consistent and smooth bar feeling throughout the power stroke when you sheeting the bar in. 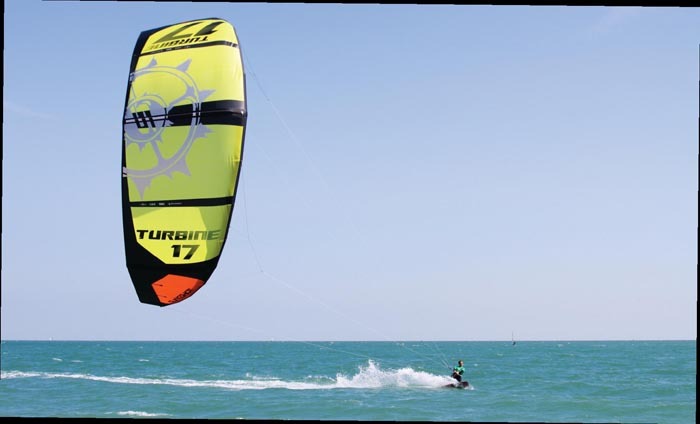 TRI-TECH PROTECTION Strategically placed reinforcements such as mark cloth and neoprene, individual scuff guards and ballistic kevlar protect the kites most vulnerable areas and optimize the kites durability and life length. SLINGSHOT ONE PUMP One pump systems are standard these days and the Turbine is of course also equipped with Slingshots patented single point inflation system to spare your time on beach and maximize the time in the water. LIFETIME RIDER SUPPORT HOTLINE If things still go wrong connect directly to Slingshots competent and helpful customer support.